Need help finding that perfect phone? 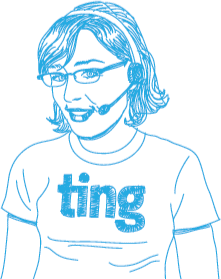 Are you an existing Ting customer. Please select the network that's right for you. If you already know which device you want, choose Yes. We'll present a list of brands, along with some popular devices. Smartphone: Larger display and advanced capabilities. Feature phone: Smaller and simpler but with longer battery life. What condition does the phone need to be in? We've sent a confirmation to the email address you provide. A Ting Personal Shopper will contact you within two business days with recommendations based on your preferences.